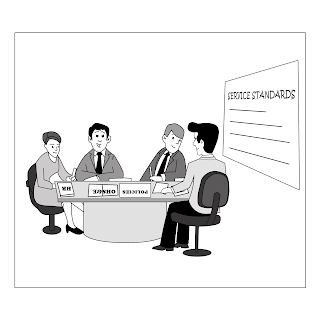 Service standards are the in-house systems and processes, policies and procedures that your organisation has created to give it every possible chance of meeting and exceeding the expectations of its customers. They create the possibility of consistency while allowing the people in your organisation to make decisions that lead to improved service outcomes. It is not always necessary to create new service standards; many of them already exist in operating manuals, rules, procedures and policies. The challenge is to determine whether they support or hinder great service. The ‘bureaucracy busting’ of the GE Workout program (The Boundaryless Organisation by Ashkenas, Ulrich, Jick, & Kerr, 1995) is an example of a process that at its very heart was about ensuring the company’s systems and processes remained aligned to serving people and achieving the organisation’s goals.